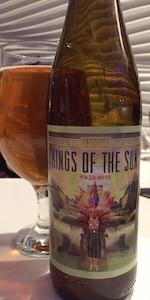 Kings of the Sun is a american style, New Zealand's hops IPA. Pours clean, mid-light amber, with virtually no head. Beautiful nose, too bad is not followed by same level of taste. A bit flat, quick finish. Overall good beer, just need more flavor (malt?) and a bit of a appearance.